"There are so many amps that are being made today that sound great when you are sitting in your living room practicing, but then when it comes to live performance applications, they simply can't step up and deliver. Building affordable and reliable bass amplification systems which are specifically designed for live performance is the foundation of everything we do," states Gallien-Krueger founder Bob Gallien. "When you look at the entire bass amplification market as a whole and analyze all of the amps currently being manufactured today, you will find that there are really only two basic sounds that are being produced, and everyone is emulating one or the other. There is the solid state G-K sound which is very articulate and punchy, and you also have the warm tube sound. Since a low rumbling bass sound can screw up the entire mix of a show, producing a bass tone that has the punch of a kick drum has really been the basis of my designs," adds Gallien. 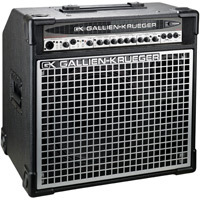 Over the past 40 years, Gallien-Krueger has become a legendary brand name in bass amplification and the world-wide leader in the production of solid state bass amps. Gallien has dedicated his ingenuity to solving the amplification problems experienced by professional bass players. Along the way, this Stanford-schooled engineer created a product line that generates some of the most sought after sounds within the bass community and conceived a list of renowned innovations which are today recognized as standards in the music industry. Found on stages and in recording studios throughout the globe, Gallien's creations are utilized by a genre-spanning artist roster of rock, jazz, fusion, and session bassists such as Flea of the Red Hot Chili Peppers, Velvet Revolver's Duff McKagan, Justin Chancellor of Tool, Ron Carter, Dave Holland, Charlie Haden, Norm Stockton, Jonni Lightfoot, and Leland Sklar. In this interview, Bob Gallien talks about his engineering philosophy, the changes he has witnessed in the amplification business, technology introduced by G-K, unique features found on G-K amps, neodymium technology, and the differences between ported and non-ported speaker cabinets. When I was a youngster, I either wanted to be a musician or a pilot. During high school, you would either find me at the local music store or at the airport. I began taking guitar lessons at Webb Music when I was in junior high school. A couple years later, I began teaching guitar there, and I had about 20 students. I was also really into electronics at that time, and I started making small modifications to my amplifiers. By the time I arrived at college, I decided to not pursue music or be a pilot. Instead, I earned an engineering degree at the University of California - Berkeley followed by a masters at Stanford University. It wasn't part of my master's thesis, but for one of my classes, I designed a really high-powered, solid state guitar amplifier. It was rated at 226 watts which was a ridiculous amount of power in 1967. Because power transistors couldn't handle that much voltage in those days, I stacked them in sort of a totem pole configuration which was an idea I borrowed from Hewlett-Packard. Across the street from Stanford, there was a music store called Draper's Music. One afternoon, I took the amplifier I had built into the store to see if they would be interested in purchasing it. The store's owner wasn't interested in it, but he was happy to sell it on consignment for me. The following day, Carlos Santana came into the store and actually bought the amp. He noticed that the amp had an incredible amount of gain so it would sustain sound forever. He had been searching for this type of sound, and it was really by luck that he found this amp that I created. He recorded his first couple albums with my amp and also took it to Woodstock in 1969. At the time, Santana was just playing as a prominent local artist in a blues band, but within the next year, his career really took off. The old Woodstock album cover has Santana on it, and you can see my amp on the cover. During college, I maintained a full-time job at Hewlett-Packard which was just across the street from Stanford, I was finishing my master's thesis, and I was also building guitar amps in my garage. I built around 25 of these amps the first year, and on the weekends, I would take them around to sell to local music stores in the Bay Area. The following year, I built about 125 of these amps. Initially, I was making guitar amps because I was a guitar player, but Jim Webb, the owner of Webb's Music, needed a powerful bass amp to power the speaker cabinets he was building in his store. If I wasn't teaching guitar lessons while working at his shop, I was helping him build speaker cabinets. 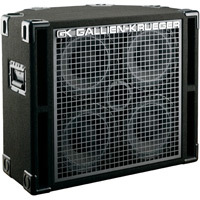 It turned out that bass players liked my bass amps more than guitarists liked the guitar amps so I saw a market for my products, and that is how I started Gallien-Krueger. I continued making guitar amps until the 1990's, but I found it very difficult to compete in the guitar market because there were so many other big manufacturers. Once I decided to focus my attention entirely on engineering and marketing bass amplification, that is when I really began to find some success. What has been your basic design philosophy behind G-K? During the first few years of being in business, I was just simply trying to make amps for musicians. After I realized that I had a real opportunity to solve the problems bass players were experiencing, I became very dedicated to achieving that. I'm still not much of a bass player. In fact, when I do play bass, I play guitar lines on it with a pick, but I have a staff of excellent bass players working here who guide me and test all of the gear. I also listen very closely to what the professional bassists who come through the door have to say about the sound they want to hear. I can then take their comments and convert them into reality through my engineering background. Adding new features to amps is actually very easy to do so I focus primarily on tweaking little variables. Musicians describe the sounds that they are hearing, and then I modify the amps to produce those sounds or eliminate unwanted sounds. I've learned a lot by attending live concerts and listening to how the bass sound interacts with the other instruments, especially the drums. There are so many great bass players, but most of the time, you can't hear any of their intricate articulations because the bass tone is obscured by the bass drum, it gets lost in the mix behind everything else, or it is literally removed out front due to it being too difficult to control. A low rumbling bass sound can screw up the entire mix of a show, and rather than try to fix it, the soundman will often just remove the bass. Back in the 1970's, there were no bass amps that had any punch to them. They produced a low rumbling sound that had no definition or projection so the first 20 years of G-K were spent developing power amps that could really punch the bass tone through any venue like a kick drum. Producing a bass tone that has the punch of a kick drum has really been the basis of my designs. There are so many amps that are being made today that sound great when you are sitting in your living room practicing, but then when it comes to live performance applications, they simply can't step up and deliver. If you are at the back of a concert hall and all you hear is the bass drum coming through the house speakers, this is because the bass amp doesn't have the punch needed to sound throughout the venue. If you walk closer to the stage, you'll eventually start hearing more definition in the bass tone, but sometimes you literally have to stand right in front of the bass amp in order to hear any definition at all. 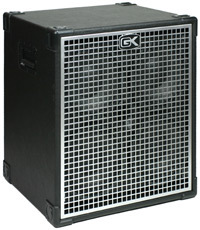 A G-K bass amp will produce the punch and articulation needed to be heard anywhere in the venue. There are a couple different things that I believe I have succeeded in accomplishing over the years that bassists have told me they appreciate greatly. First, I designed an amplifier that allowed bassists to be heard in a way that they couldn't before my amps were introduced. Second, I created an equalization system that was extremely serviceable and musical. Back before we had computers to assist with designing different products, I filled a two-inch binder full of loose leaf paper with handwritten calculations of my equalization system. Those equations just went on forever. That equalizer was put into the 800RB in 1980, and it is still utilized in every amplifier that we make today. The concept behind the equalizer is a very basic one in that my goal was to create an eq that produced a desirable sound regardless of how the controls were set. You can't get a weird sound out of the G-K eq no matter how you position the controls. It has tremendous flexibility, and it will allow you to equalize any bass to any cabinet in any sized room. It is not a graphic eq. I really developed a hatred for graphic equalizers because they just screw up bass tone. The G-K eq is a very bass specific equalizer that is still very different from everything else that is being built today by other companies. It took me a long time to develop a formula, but once that was accomplished, it was just a matter of refining the product, making it reliable, and constructing it so that it could be mass produced. Bass players around the world have really fallen in love with the G-K sound. How has the amplification industry changed since you started building amps in the late 1960's? There have been a number of changes that I've witnessed over the years. Some of the changes have been trends that have just come and gone while other things have become remarkably stable. The thirst for more power has increased significantly. In the 1960's, a 200 watt amplifier was more than sufficient to play practically any gig. That was an amazing amount power back then. When Duff McKagan was playing with Guns 'n Roses at the peak of their popularity, he was using a 300 watt 800RB. Today, when Flea is playing a similar sized event with the Red Hot Chili Peppers, he uses four of our 2001RB's which put out 1000 watts each. You can't even sell an amplifier with only 200 watts anymore. The smallest professional amp that we currently have in production has 300 watts. I honestly felt like the market for tube amps was going to die in the 1960's, but they are still around. When I realized my true mission in designing a bass amp, I had absolutely no ambition to make my product sound like a tube amp. I wanted to take the best attributes of a solid state device and make an amplifier do a job. Tube amps do a job that is well suited to tubes, but G-K amps perform a job that can only be accomplished with transistors. If you analyze all of the amps currently being manufactured, you will find that there are really only two basic sounds that are being produced. There is the solid state G-K sound which is very articulate and punchy, and you also have the tube sound which is very warm. Bassists are tired of carrying around really heavy gear so there has definitely been a push to produce more lightweight amps and cabinets. It will be interesting to see how lightweight things go in the coming years. In the early days, we were known for making the smallest and lightest gear around. Today, there are companies that are able to manufacture products that are smaller and lighter than ours due to the improvements in switching technology. In the 1980's, I made an entire line of amps using switching technology, but I quit pursuing that effort due to the failures of the technology at the time. Does the G-K tone of today differ from the G-K tone of the 1980's? There has definitely been a change in the amps just due to the improvements in technology that have occurred over the past 25-30 years. Power transistors, for example, have improved dramatically. The power amps of today can be ran with lower feedback. We can also get much more current out of them than was possible back in the late 1970's. As a result of these technological advances, this generation of G-K amps has much more punch than what was possible through the amps made several decades ago. In terms of the tone and equalization on a G-K amp, that is exactly the same today as it was many years ago. Our amplifiers are now quieter because we have integrated more discrete electronics. I'd also say that within just the past few years, our amps have become warmer in sound. When a power amp puts out as much power as it is capable of producing, that is referred to as "hitting the rails." The way our amps go in and out of the rails is very different to how other manufacturer's amps react. Sometimes you will hear guys talk about "the G-K growl." If a bassist is used to playing an 800RB, he'll know exactly where he needs to place the controls on his amp to get that G-K growl. If he then moves to the 1001RB-II which puts out over twice as much power as the 800RB, he'll have to play his amp much louder to get that same type of growl. I have found that this is one of the biggest things that bassists have to learn in moving to a more powerful amplifier. If you want to maintain the classic G-K growl and don't need to play at loud volumes, then you definitely want to stick with a lower powered amplifier so it is easier for you to hit the rails. Which amplification innovations did G-K pioneer? If you stand back and look at all of the bass amps in the world today, you will notice one obvious aspect of all their designs. They are all constructed of a metal enclosure. When I started making bass amps, everyone's amplifiers were contained within a wood box. I was the first engineer to enclose an amplifier in an all metal package and make it rackmountable. The 800RB was the first bass amp to feature a bi-amp mode and a DI. We were using speakon jacks long before anyone else. When I designed our first 1000 watt amplifier which was the 2000RB, 1/4" jacks couldn't handle the current and would melt. Speakon jacks can handle 30 amps whereas 1/4" jacks are only rated at about 2 amps. I was making and shipping channel switching guitar amps several years before anyone else and five years before someone decided to patent it. I also designed the first horn management system for bassists. What distinguishes G-K amps from its competitor's products? When you look at the entire bass amplification market as a whole, there are really only two basic sounds that are being produced today, and everyone is emulating one or the other. I read every G-K warranty card that is sent to us. One of the questions asked on the card is regarding which other brands were considered before purchasing our product, and over 90% of the responses refer to only one other manufacturer. Rarely does anyone write down someone besides our biggest competitor. The main difference between us and our primary competitor is that we are known for the articulate and punchy tone of our solid state amps, and they are recognized more for the warm sound produced by their tube amplification. We design and manufacture our own speakers. Our Paragon loudspeakers are utilized in conjunction with our cabinets which is kind of unique because practically everyone else installs outsourced speakers that were created by one of the major speaker companies. Other cabinet builders just put some speakers in a box and slap their name on it. Since most professional amplifiers and cabinets have the same basic features, generally speaking, I think it really depends on what the individual player wants to achieve when it comes to purchasing a particular piece of gear. Can you tell us about G-K's horn management system? Our horn management system has three primary functions. Every other manufacturer who has a horn in their cabinet has the control for it either on the back or on the side so you always have to reach around the cabinet to adjust its level. On G-K amps, you can adjust the level of the horn right from the front of the amplifier which is very convenient, and you can also mute the horn with a footswitch on some of our amps. Our amplifier design consists of two separate power amps. One of those is a 50 watt amp that is dedicated to only driving the horn. This means that you can't put enough power into our horns to blow them up. As a result, we rarely, if ever, lose a horn. If you look at every other amp manufacturer, they are typically driving their horns with 500 or more watts of power. The final advantage of using the horn management system is more subtle, but it's still very important to note. Our woofers are designed in a fashion to cut off the high frequencies at a level of distortion that sounds pleasant and sounds like growl. If you are driving a horn with the same power amp as the woofer, instead of that pleasant sounding growl that bassists desire, you receive unwanted buzzing because now that distortion is coming through the horn. When you have a separate power amp for the woofer and a separate power amp for the horn, you can boost the volume control of the woofer amplifier in order to achieve that growl, and you can keep the level of the horn amplifier below clipping. This configuration will allow you to isolate the growl from the clean articulation in your sound. We ship a special speakon cable with every bi-ampable cabinet we sell which contains two sets of speaker wires. There are two wires that go to the woofers, and two wires go to the horn. You need this cable in order to send separate signals to the woofers and horn. No other manufacturer has a crossover network in their cabinets that will accommodate this feature. They might make use of connectors for speakon cables, but they are full bandwidth. On the back of our cabinets, you will find a bi-amp/full range switch that offers you the option to run the speakers in a bi-amp or full range mode. In the full range setting, the cabinet works just like every other manufacturer's cabinet, and you can drive the speakers with anybody's amplifier hooked up to it with a standard cable. In bi-amp mode, the woofer and horn paths are separated, and they can be driven with our amplifiers using our special speakon cable. All of the frequencies above 5 kHz are sent through the horn, and everything below 5 kHz is sent to the woofers. On our new amplifiers, there is a button on the front panel which you can push in or out to send all of the bandwidth to the woofer or cut it off at 5 kHz. This is a feature that is aimed towards bassists who are trying to achieve a high degree of articulation. If you run the woofer at full bandwidth, you will receive a beam of high frequency energy that comes straight out from the dome in the middle of the speaker. With the high frequency cutoff switch, you can roll off the high frequencies and keep them from going to the woofer. How does the 5/4 string voicing filter work? One of the biggest keys to making a great bass amp is the manner in which you roll off the low end because you really have to pay attention to the roll off rate and the way it fades. Nowadays, speaker systems can handle really deep bass sounds, but back in the day, they couldn't. At the time, everyone was playing 4-string basses so the demand for producing lots of really deep bass was not there. For example, the 800RB doesn't produce a lot of low end response, but it has just enough to accommodate the frequency range of a 4-string bass. That amplifier is not going to work all that well with the B-string of a 5-string bass due to the bass frequency roll off that begins gradually at around 100 Hz and then really falls off quickly at 40 Hz. The 5/4 string voicing button is something that has been added to our amps in order to extend the roll off of the bass frequencies produced by 5-string basses. This is not just simply a bass boost button which works like a graphic equalizer, and it isn't a feature that was conceived by a sales department which decided it would be a good idea to add for marketing purposes. Our button doesn't boost anything. It extends the roll off of the low bass frequencies which don't begin falling rapidly until around 30 Hz. If you are playing a 4-string bass and trying to replicate the classic sound of the 800RB, you will want to have this button out because the 800RB doesn't produce a lot of deep bass. If you are playing a 5-string bass, you will want to have that button pushed in. Some 4-string bassists will actually leave the button pushed in at all times because they want as much low end as they can get. This button solves a particular issue regarding the extended frequencies of 5-string basses, and at the same time, it permits us to bring our heritage with us as we move into the new era of amplification. Is there much of a sonic distinction between front-ported, rear-ported, and non-ported speaker cabinets? The low end of a non-ported speaker cabinet is going to roll off sooner, but it will roll off at a slower rate than front or rear-ported cabinets. With a ported cabinet, you can tune it so that it extends the low end frequency response, and the entire system won't start rolling off until you are at a lower frequency. There are different things that you can do in the design of a cabinet to adjust its roll off frequency, but for the sake of comparison, we'll use this example. If you have a non-ported cabinet which has a bass frequency roll off at around 100 Hz. You could extend that frequency roll off down to around 75 Hz by making it ported, but now the roll off rate will be twice as fast. If you plotted these results on a chart, you would see that the bass frequency response of a non-ported cabinet would begin earlier at a higher frequency, and the frequency response of the ported cabinet would stay flat longer. However, once the frequency response of the ported cabinet begins to fall, its rate will be twice as fast, and it will eventually cross the roll off rate of the sealed cabinet on the chart which means that the sound from the ported cabinet will have less energy at lower frequencies than that of the non-ported cabinet. If you stand in front of a front-ported speaker, you will notice that the air moves out of the ports at a high rate of velocity. The high velocity air that is coming out of the ports is not matched to the impedance of the free flowing air that surrounds the cabinet. Once you get about 20 feet away from the cabinet, the energy coming out of the port is converted to a pressure wave, and then you can really hear it. When bassists attempt to describe this experience, they will often say that front-ported cabinets tend to throw the sound better than a sealed box. Some guys don't like the sound of ported cabinets due to where their cabinet is located on stage in relation to where they are standing. Some bassists stand right in front of their rigs on stage and prefer the sound produced by a sealed box for this reason. Other players move around more on stage, and they want their cabinet to throw the sound more so they'll use ported designs. There will be a slight difference in the sound produced by front-ported and rear-ported cabinets. Since low frequency waves are omni-directional, once you move a few feet away from a cabinet, it isn't going to matter that much if it is front-ported or rear-ported. The biggest difference will be noticed while standing right in front of a front-ported cabinet due to the air moving at a high velocity. Some bassists like the feel of the air moving at a high rate, but then this comparison becomes more of a difference in feel than in sound. There are so many variables involved in cabinet design. It depends on how the cabinets are tuned, but in theory, ported cabinets will generally produce more energy than non-ported cabinets. However, if the roll off rate occurs abruptly at a low frequency in a ported cabinet, then a sealed cabinet could potentially outperform it. This is all theory, and if you modify the configuration of the speakers in the box and the resonant frequencies of everything involved, you can really change the overall performance of the system. In my opinion, there is no "best" cabinet configuration. Each cabinet has its own application, and as a bassist, you should choose the system that will suit your needs the best. What are the advantages of utilizing neodymium technology? The primary advantage is that neo speakers weigh less than ceramic speakers, and since bassists are wanting lighter equipment, this is very appealing to many players. Neo speakers also produce a different type of tone, but I wouldn't really consider that an advantage. It's just another option. Anytime you have a change in technology, you are going to have a change in sound, and you have to learn how to optimize what that particular component is capable of doing. We are in the process of expanding our Neo Series. In addition to our Neo 112, Neo 212, and Neo 412 which are currently available, we will soon start shipping the Neo 410, Neo 210, and Neo 115-II. All of the Neo Series enclosures feature our own neodymium-equipped, Paragon loudspeakers. Can you explain the variation in sound produced by G-K's neodymium and conventional loudspeakers? Neo speakers are very linear sounding, and they have great definition. Depending on who you pose this question to, you will receive a different response. Rock bassists will define linear as sounding sterile or cold whereas a jazz bassist will say a neo cabinet sounds cleaner than a cabinet with traditional ceramic speakers. Ceramic speakers actually develop a small amount of distortion inherently due to their construction, and there is no way to not have some of that distortion present no matter what you do. This slightly distorted sound is desirable to some players and to others it isn't. Even though this isn't the perfect comparison, going from conventional drivers to neo speakers is kind of like going from vinyl to CD format. What we are learning through our experience is that the rock artists are sticking with the ceramic speakers while the jazz, fusion, and christian bassists are leaning more towards the neo speakers. Did you have a specific performance application in mind when designing any of the G-K products? We make all of our products with a very specific target audience in mind. Everything we design is made for live performance applications. Live performance is the foundation of everything we do. For example, the MicroBass Series was specifically designed for acoustic upright bassists, and it has been extremely successful. In terms of our other product lines, we certainly do focus our gear on bassists who play aggressively. Which products have proven to be G-K's most popular units? Even though we don't do any advertising at all for them, the most popular head that we have in production today is the 300 watt Backline 600 Series amplifier that is made in China. We sell enormous amounts of those amps because they are affordable, reliable, and they get the job done. In fact, this amp is probably the most popular amp in the world. Although it is made in China, it is constructed with all of the same components that you will find in our American-made amps. This isn't a stripped down head that is made with cheap parts. The Backline 600 is basically a 400RB-IV that is made in China. It's inexpensive, and it's a really reliable, well-built product. If you are just looking at the numbers, our Backline Series cabinets which are made in China with our own drivers are definitely our best-selling cabinets. The most popular American-made amps that we sell are the 700RB-II and 1001RB-II. In the professional series, the cabinets with ceramic speakers are still more popular than the cabinets using the neodymium technology, and the 410 speaker configuration is by far the most popular cabinet setup. What do you feel has contributed the most to the longevity of G-K? We have continued to produce really solid and reliable gear throughout the years. I really enjoy my job, and I've been so determined and committed to pursuing this since the late 1960's. Even though we've experienced some difficult times in the past, I just can't imagine doing anything else. I'm an avid swimmer, and when you are in the last lap of a race and you can't even lift your arms out of the water because you are so tired, I've always told myself that the other guy is just as tired as me, and I've never given up. It's the big gun and G-K's candidate for the ultimate stage rig! This unit is based on the bi-amp system from the 1001RB-II but with dual 540 watt woofer amps bridgeable to 1080 watts, two 50 watt horn amps, and two continuously variable speed fans for cooling. The 2001RB provides the deep, floor-shaking sound that powers a reggae band. For rock players, it features a special design distortion circuit that lets you quickly dial in the perfect growl and drive. For funk players, its voicing filters and bi-amp controls let you scoop the mids and add the perfect high-end edge needed for popping. For the style of music performed on arena stages, the 2001RB is destined to be the premier amp of choice. The secret to the 2001RB's smooth natural distortion is that the horn amp is automatically muted when the high gain channel is activated, thus preventing raspy distortion from the horn. The horn amp can also be muted on the low gain channel as needed for certain blues sounds. Such horn muting is only possible with a bi-amp system, and the 2001RB has the proper circuitry design. Easy onstage control is provided by a three button footswitch which mutes the horn, selects channel A or B, and also activates the tuning mute. An 8-bit microprocessor constantly monitors the 2001RB system making sure everything is running correctly. It waits patiently for you to push the power switch and then sends a signal to your other G-K power amps to turn them on in proper order. Artists such as Flea and Tom Hamilton use up to five heads, and with the 2001RB, they only push one switch to fire up their entire system. The Fusion 550 is the first G-K product to incorporate tubes into the design. The Fusion 550 features a uniquely designed six stage tube preamp paired with a 500 watt version of the high current solid state power amp used in the 1001RB-II. The rich warmth of tubes combined with the quick, punchy power that G-K bass amps are known for is an experience like no other. And as if that wasn't enough, G-K takes the next step in innovation by adding motorized knobs which allow you to store two different tone settings such as one for slap and one for fingerstyle playing and footswitch between them. Possibly a first for a fully analog bass amplifier! The Fusion 550 also features an updated version of G-K's exclusive 50 watt horn bi-amp system. Dial in the horn where you like it and as you adjust your volume with the master control, the ratio between the woofer and tweeter is preserved. The EQ section is an active tube version of the solid state EQ from the legendary G-K 800RB amplifier. Other features include deep and bright switches and a contour with two frequency selects. The rear panel includes neutrik speakon and 1/4" connectors, effects loop, tuner out, footswitch input jack, and a transformer isolated DI for hum-free operation. The Fusion 550 uses a toroidal transformer for maximum reliability and efficiency. Yeah, tube amps have been around for decades, but you've never heard one like the Fusion 550. 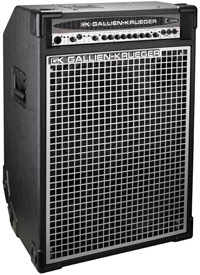 When it comes to powerful bass amplification in a compact, sturdy, road-worthy package, Gallien-Krueger has ruled for over three decades. That reign continues with the introduction of the Neo Series bass enclosures and combos. The Neo Series combos pair a high powered Artist Series head with the popular Neo Series speakers. At the core of these front-ported cabinets are custom-designed, cast-frame neodymium loudspeakers which maintain high power output at a fraction of the weight. These combos were designed for easy transport, ruggedness, and to deliver the tone and consistent output that leads to exceptional musical performance in any size venue. The Neo Series combos provide the best in bass sound and are priced to rank among the best values in bass gear. It wasn't easy to make a great bass amplifier even better, but Bob Gallien has managed to do just that with the introduction of the MicroBass Series III. A long-time favorite of session bassists such as Leland Sklar, Charlie Haden, Ron Carter, and Jimmy Earl, G-K's MicroBass remains the industry standard for high-quality, compact bass amplification in and out of the studio. The MB Series III improves on its predecessor with an improved signal to noise ratio (-90dB) and much cooler operation. In addition to the popular combo version, this little tone giant is now available as a 150 watt, pocket-sized head that can be paired up with the cabinet of your choice.